CIS is situated by the water at Levantkaj in Copenhagen’s new CO2 neutral suburb. It’s a lively, bustling area; where the tax-free harbour used to be, a new Metro station will open next year. Containers still arrive with goods from around the world, but now students and staff also arrive at the the new campus for Copenhagen International School. With room for 1,200 students of all ages from pre-school to the diploma program and facilities that cater to the wider international and local community, from the beginning it has been the goal both to signal transparency and inclusion – as well as to provide the best possible learning and teaching environment. 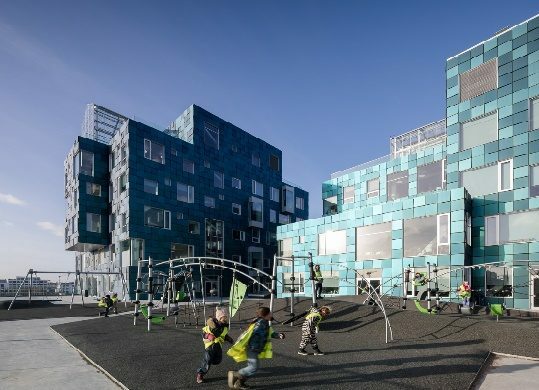 Anders Smith is not only one of the board members at ECIS, he has also been the driving force behind what is one of the most unique school building projects in Denmark. An architect and designer, Smith was responsible for some of the more innovative aspects of the design and worked closely with the building’s architects CF Møller. Here, he shares his thoughts on the building. The building is covered with 12,000 custom designed solar panels with micro-inverters that supply approximately 50 percent of the electricity used in the school. Most of this electricity is used to drive the ventilation and the LED lighting system. The ventilation system has been a specific focus to ensure a high oxygen content, and sensors in every room ensures we not only achieve this but also enable three times the airflow recommended in new schools, while ensuring optimal a draft free and comfortable indoor climate. 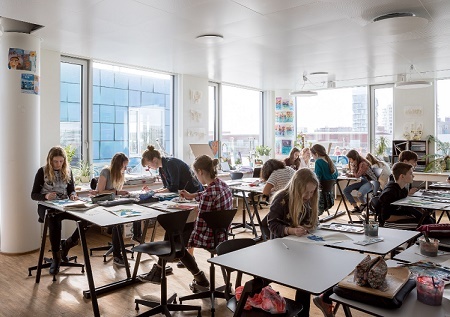 The custom LED lighting system allows users to control the intensity and colour temperature of the light everywhere in the school to fit the activity and personal preferences and that we can provide far stronger and better light than normally required in office and schools, as research has been shown to have a strong impact on performance and health. Everyone arrives on the first floor from the north across the small bridge into the base of the school ensuring that they all have a chance to meet and access can be controlled. This also enables the wider public to come closer and see what goes on. We have ensured that large windows everywhere not only provide large amounts of daylight but also engage with visitors to the waterfront and show all the great things the students and staff are doing. As we would like our students and the wider community to engage, we have built play facilities and ball courts for public use on the north side of the school and the clean water of the harbour has already made it a popular destination for anglers of all ages to catch herring and mackerel. The schools is designed to provide a home for everyone and is structured along the lines of a small city around a central meeting space where we have the library and canteen. Both are places to hang out, wait for family member or friends, share a meal or look at media. Around this heart we have the cultural facilities, with the theatre accommodating 350 as well as smaller performance spaces, the three large gyms with the fitness centre and dance studio – as well as the music classrooms and many practice spaces. Above this base of shared cultural facilities we have the 4 schools and the playground. 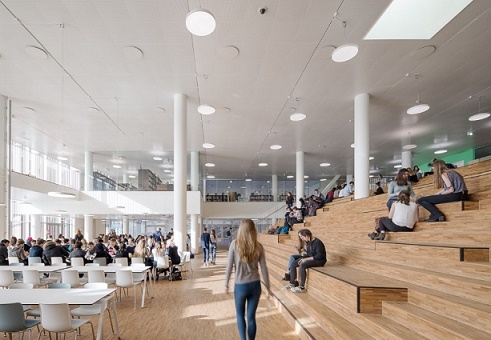 Each of these 4 buildings is designed to created the best possible learning environment for the students at their individual age, so that spaces, facilities and furniture supports developmental levels and learning models. Multidirectional daylight is beneficial to the learners and we placed all the classrooms on the corners of the building. British anthropologist Robin Dunbar’s research has shown that a person can only maintain a stable relationships with maximum 150 persons so we therefore designed each floor to hold an entire grade level, with 4 classrooms, staff offices and extra learning spaces to ensure a strong sense of home and belonging. To further strengthen this experience we ensured that every floor is unique and no two rooms identical, as well as easy to identify from the outside. On the top of each of the four sub-schools (early years, primary, middle and high school) we have placed greenhouses and ball cages to isolate the ball playing from the regular play in the playground and to facilitate the maximum number of participants and movement. The greenhouses provide a sheltered activity space and a space for age appropriate science exploration – as well as a chance to grow vegetables for preparation in the school kitchen. The central library and canteen space is built around the large atrium staircase, where the students, staff and parents collaborate, present and congregate. The large windows towards the water let in a lot of light that together with the oak floors, makes it a bright and friendly space with constant activity throughout the day. Through the glass walls to the middle school gym it is possible to follow the activities. Learning in early years and primary school is very classroom-centred and often station based, so all the furniture is designed to be on wheels to allow teachers to easily customise the layout. The rug becomes a gathering spot to share and tell stories. Between the classrooms and across the school we have designed a number of spaces for students to work alone or in groups. These are based on the theories of the American didactic theorist David Thornburg, who described four different contexts for learning. The ‘cave space’ is where you focus and achieve flow as you engage in a personal pursuit, the ‘watering hole’ is where you share with peers, explore ideas together and collaborate towards a shared goal. The more traditional school space he calls the ‘campfire’, where a teacher shares knowledge or a story. This latter context is what we normally think of when we think of schools, but the former two we know mostly from work spaces where we call them workspaces and meeting rooms. The final context is ‘community/life’ where we are able to apply the things we have learnt and learn how to be part of a community. We built flexibility into the school at all levels to facilitate not just the way we teach and learn today, but also how we currently think learning will change in the future. From mobile furniture with age appropriate ergonomics to prevent back problems and allow easy reconfiguration of learning spaces and an LED-based lighting system that makes it easy to change lighting levels and light quality as well as placement of fixtures, to a building construction that simplifies future remodelling by having lightweight interior and exterior walls. Placing the playground on the second floor ensures a safe playground and a short journey from classroom to playground for smaller kids, but also gives some shelter from the wind and provides a better view out to all the wind turbines at sea and all the way to Sweden.